Maybe the reason I’ve been baking since I was a little girl is that it’s in my blood. I’m sure that’s what my grandmothers would say. And my maternal grandmother would proudly remind me of her brothers, the Marcils, who ran a bakery in the small town back east where my mother grew up. Later, out in California, when I was growing up, my grandmother would show me the way her brothers taught her to make pie crust, and when she was pleased with my efforts, she bequeathed me a pastry cloth they used in their bakery. I still have it. It’s been decades since I made pastry with crisco or butter, but I still love to bake. 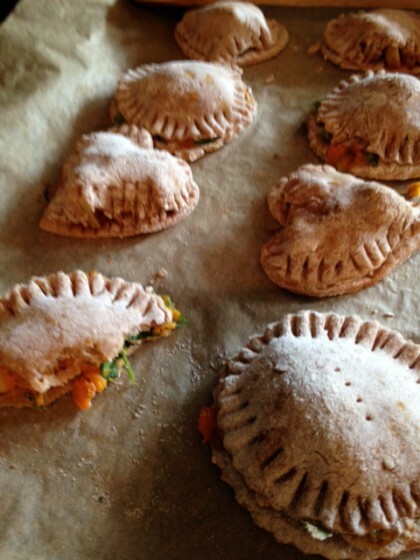 So when Kelly, my daughter-in-law, got into making vegan hot pockets, I caught the enthusiasm too. Like I always do when I want to try something out, I googled “spelt hot pocket dough” to see what would come up. I found this little gem of a post from Berlin By the Bay–Berlin Bites: Sweet Potato Hot Pockets. Although when my search first coughed this entry up, I thought I might be surfing over to a German blog, it turns out that Berlin is a toddler living in the Bay Area, whose mother, Jordan, writes a blog about healthy food she makes for her daughter. I loved the ease and playfulness of the basic recipe, which I hope you’ll check out (she used a cookie cutter in the shape of a porcupine). I wanted to make my hot pocket dough oil free and lower fat, but I loved the idea of using cookie cutters for making small hot pockets. And as Jordan says, you can basically fill these with anything. Her filling is savory sweet potato-black bean-greens combo based on what Berlin will eat. I wanted to improvise on that with what I had on hand, and also try some fruit fillings. I’ll share 3 fillings and an oil free dough here, but please go on over and check out the original recipe, too. If you are one of my many gluten free readers, have no fear, you will not be left out. I also made a batch of gluten-free hot pocket dough, and I’ll share that here too. You don’t have to be a toddler to enjoy these little bites of goodness, but if you have a toddler in your life, these sure seem like good healthy eats on the go for little ones. Place flour, flax egg, nuts or seeds, salt and about 1/3 cup of the water in the bowl of you food processor fitted with the S blade. Process. Add the rest of the water a little at a time until the mixture begins to form a dough that pulls away from the sides and sticks together in a blob. Turn out the dough onto a well floured surface. (I use a combination of spelt flour and brown rice flour, which is very non-sticky. If you’re making the gluten-free dough, just use brown rice flour.) Roll it out with a rolling pin to about 1/8 of an inch thickness. These are rustic, so don’t worry about being too precise. Cut shapes with your favorite cookie cutter. (I used a heart, because, well, it’s a heart, after all, and hearts are easy to fill–and a large biscuit cutter. You could also use the rim of a wide mouth glass jar.) Place on baking sheet lined with baking parchment. Fill with fillings of choice (see my offerings below). Cover with a second heart or circle. Crimp the edges together with the tines of a fork. Prick the top once with the fork. Bake in the oven for 10 minutes. Wonderful while warm, but will keep for a few days and can be eaten cold too. Chop the arugula and green onion. Mix in a bowl with the sweet potatoes, chickpeas and spices until everything is coated with potato and spice. Spoon onto the bottom layer of your heart or circle (or whatever shape you make) pocket. Cover, and proceed as above. Combine in a bowl until the apples are coated. Proceed as above. Again, mix until the pears are coated and proceed as above. Spelt dough on the left, gluten free dough on the right. No need for cookie cutters either, you can also go free form! I was lucky enough to have one of my dearest long-time friends from Moscow come through Portland recently. She brought me pears from the tree at my old blue house, thoughtfully entrusted to her for me by the woman her lives there now. I wanted to do something special with them, so all the hearts I made I filled with that special fruit. The apple, too, came from a friend’s tree. Each bite reminds me of the gifts of Fall, and all the special people in my life, and how happy it makes me to be baking again, sharing a healthy twist on an old favorite. I didn’t get my great uncles’ pastry cloth out, but I did roll the dough on my grandmother’s old kitchen table, where I learned to roll dough, and make other treats my grandmother made at the holidays, like dates stuffed with peanut butter and rolled in sugar. Even though my ingredients have shifted away from sugar and fat, I like to think she’d be proud her table is still laden with the loving labor of making good things to eat, and sharing them with friends and neighbors. 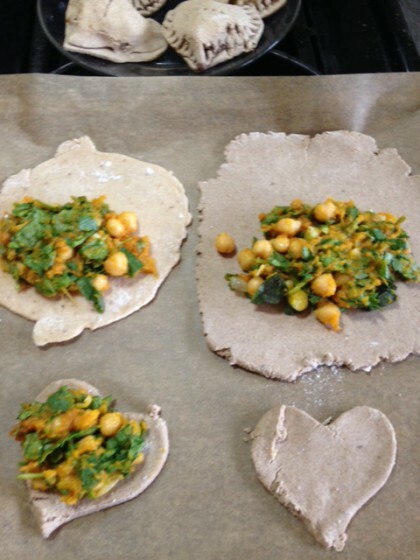 Oh these look wonderful Maria…….versatile, hearty, tasty & ever so pretty too. Absolutely perfect for Fall & Winter – my head is swimming with fun, creative shape ideas. Thank you! You’re welcome Debra–I appreciate your kind words–and please share whatever creative shapes you come up with! What timing! I’ve been dreaming about just this sort of dish but didn’t know where to start! They look/sound yummy and I can hardly wait to make them. I will try both savory and sweet as my honey has a sweet tooth and will REALLY appreciate them. Love the hearts! What a lovely recipe! Haven’t had one of these in ages. Never had a sweet pasty, but am anxious to try the pear and fig one. 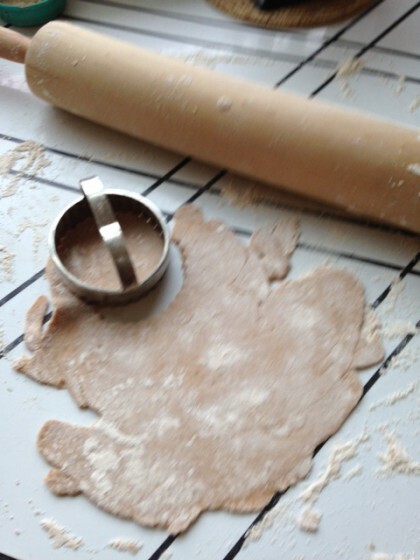 Do you have a recipe for the dough using whole wheat flour? These look divine! Thanks for the gluten free version-always helpful! I will make these very soon! Ooooh! I have been searching for something like this for weeks. I have been wanting to make some hot pocket type something or other, but the crust with the butter, shortening or oil kept me from doing so. I cannot wait to try this using some of the apples we picked from our trees. I’m going to make these on the next cooler day! They look fabulous. 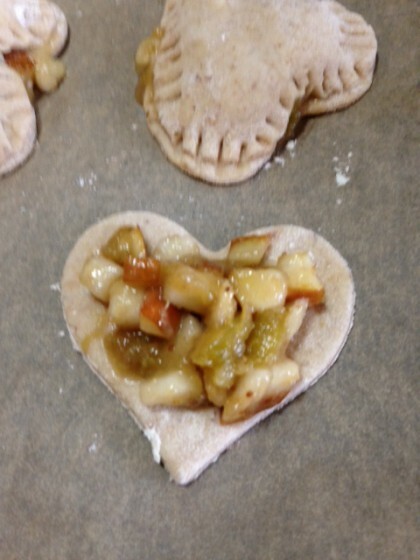 What a great way to connect with the fruits from your old house, to bake them into hearts to be enjoyed while in your new location. You are the mistress of perfect concepts. Wow, “the mistress of perfect concepts”. . .I am going to savor that title, Danielle!! 🙂 Thank you! 🙂 And hope you enjoy them on an cool day when it’s cozy to turn the oven on. That’s what I’ve done too. You posted them! And they look absolutely wonderful. I’m so impressed — I know you say it’s fine to keep ’em rustic, but they look awfully pretty to me, like something you could buy in a fancy bakery. It has taken me a long time to warm up to baking, because for a while I associated it with my eating disorder (I used to bake a lot, but not eat what I made) in sad ways. I’ve rediscovered baking this fall with the cooler weather, and I’m having so much fun making a weekly batch of muffins for snacks. 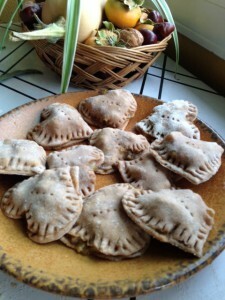 This post inspires me to try sweet hot pockets, and I think savory ones (with winter squash) would also be delightful. Great filling ideas, too! Hi Maria, thanks for including a gluten-free version! These look so delicious; I used to be a Hot Pocket (well, a Lean Pocket) addict before I went plant-based, so I’m really excited to try these. Like you, I also love to bake, and since we just had our first really cold snap, I’m itching for an excuse. These look fantastic. I am going to make the spelt dough. Thank you so much for the great recipe.